I used to make Puppy’s food because he couldn’t seem to tolerate dog food. I somehow forgot the reason that I was making his dog food, though, and had been feeding him bagged dog food mixed with canned because it was easier. He lost a LOT of condition over the summer and was scratching himself raw despite my using Advantage on him. D’OH! Then I remembered that the same thing had happened when he was on dog food before! I use several recipes that are similar to this one. The one that Puppy is eating tonight had 3 lbs. mixed hearts and gizzards, 2 cups of white rice, 4 cups water, and a tsp. of garlic powder. I brought the water to a boil, added the rice, garlic powder, some salt, and 3 lbs. chicken gizzards and hearts, brought it back to a boil, then turned the heat down to very low until the rice was nice and soft. Then SwampMan came into the kitchen, checked the pot of dog food, got a bowl, and helped himself to the gizzards, hearts, and rice. *sigh* He pronounced them very good. AFTER SwampMan raided the dog food, I added leftover sauteed fresh spinach to the pot. If this were all the food Puppy got, it wouldn’t cover his nutritional needs. However, Puppy also gets raw bones (turkey necks, chicken backs, pigs feet), raw meat such as raw leg quarters, beef hearts and kidneys, etc., a 15-oz. can of jack mackeral once or twice per week and, of course, eggs and miscellaneous table scraps. That’s the funniest story I’ve read this week. My dad bred and raced greyhounds back in the thirties and forties and we had three farm dogs too. Canned or packaged dog food would have seemed an effete luxury if it was even heard of, specially in war time. One time around 1953 my mum bought a couple of cans of dog food, seemed weird to us that someone would go to the bother of actually canning it. She put some in a bowl for my brother’s German Shepherd, he sniffed it, turned around, cocked his leg and pee’d on it! So, what’d he feed his dogs? I don’t remember much, I know he used to get ‘lights’, which is the lung, obviously not used for human consumption, which he’d boil, mix with meal of some sort. Also he’d get the discarded beef fat, bake it in the Aga* until it was crisp, we kids used to love that! The fat was saved for ‘dripping’ which we’d have spread on a slice of bread and butter with pepper and salt, delicious! A rather disgusting thing he’d get was a cow’s head which he’d put out in one of the fields, the dogs would chew on it and also drag it which was good exercise for their shoulders. Wish you hadn’t asked? 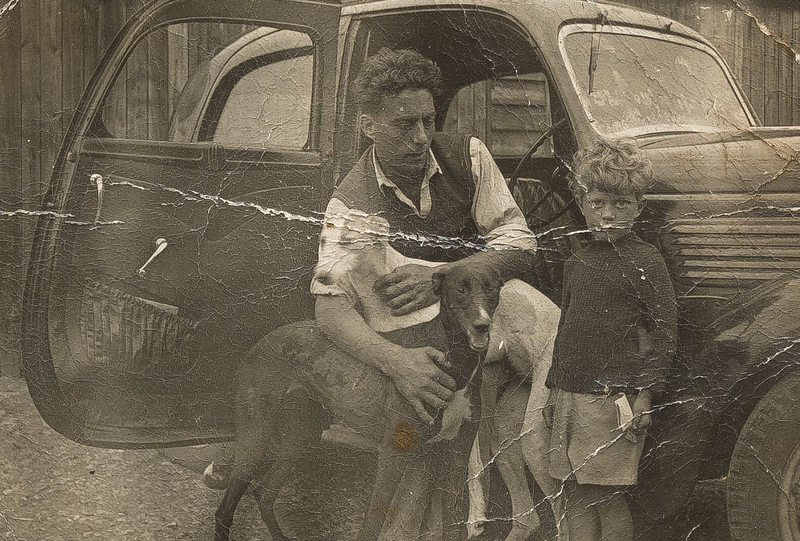 Here’s a bit creased up pic from around 1940 of him with two of his dogs plus me aged four or five. Oh, you were certainly a big-eyed cutie! I would LOVE to have an Aga. That thing would give us the little bit of heat boost we need on the coolest days here! Unfortunately, we have a lot more hot days than cold days. I was, wasn’t I? Wonder what went wrong!